Men are from Mars, Women are from Venus, but we all live and love on Earth. John Gray is the leading relationship expert in the world. His relationship and health books have sold over 50 million copies in 50 different languages in 150 different countries. 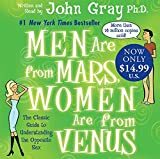 His groundbreaking book, Men Are from Mars, Women Are from Venus, is the best-selling non-fiction book of all time. It launched his Mars Venus book series that forever changed the way men and women view their relationships. John’s newest book is titled, Conscious Men: A Practical Guide to Develop 12 Qualities of the New Masculinity. Conscious Men guides a man to look within and discover his purpose and mission; to be in touch with his feelings but not ruled by his feelings; to live a life that is in pursuit of his path, while honoring the commitments he made during that pursuit. This book is a practical road map to support every man to discover and live his unique calling. John continues to travel the world teaching communities and companies the best ways to improve their relationships and communication. He has appeared on The Oprah Winfrey Show many times as well as The Dr. Oz Show, The Today Show, CBS Morning Show, Good Morning America, The Early Show, The View, and many others. He has been profiled in Time, Forbes, USA Today and People. John Gray lives in Northern California with his wife of 30 years, Bonnie. They have three grown daughters and four grandchildren.